Hey people, time to get your cyber hands a little dirty! Everyone likes to imagine their dream starship, whether so you an play with it on galciv2 or not it's always something we sci-fi fans love to think about. Well now's your time to share. It doesn't matter if you can not draw for nutts! Just pour your heart and soul into a drawing or picture or model of your dream ship or ships. Let go and have fun, use any program you like. You can even just describe it to the rest of us if you like through text. For those of you with a more creative swing you can even give us the full cinemas experience as you tour us around you ship on a MPEG, AVI, or whatever file. Just go nutts with it people, lets get Creating! Important notes to remember: This ship's fax machine is located between his lower back and upper thigh . It can even print coins . Now this is a ship! lol, what a ship, sure wish I had one of them. 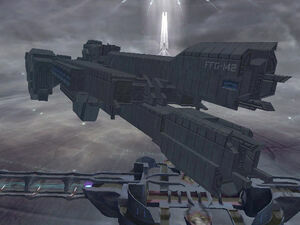 Hey, sure heres my ship that i just recently finished I called it the Magnius. wow! that is a sweet ship... what program are you using? can you make custom ships for Galciv2 with it? coz i'd praise you if it could. I'd desing ships with ratating section to generate gravaty. That Pro-Engineer 3.0 you talking about..it any good! I mean can it export models into Sins after? If so, might be interesting!!! Oh idk, well i know you can export the parts from Pro-E into Maya as .obj cuz i have both. But it's huge in Maya so you'd have to scale it down(i mean huge). I've never modded or anything but maybe...do you have or use Maya at all? you've got to host your image on a site, like photobucket or imageshack, then it will provide you with a url link to your image. One you've done that copy your image url into the Insert/Edit Image area. it should apear. ps. flickr is not a valid hosting site. Oh ok, I'll look into it. Thanks...+1 Karma!! Here is my Human Carrier....don't copy it or I kill you!! Do people see the pic of the ship that i made that I uploaded? I can see it but i was wondering if it showed on others' screens? these are all fantastic peices of work so far. Well done all of you. Hope top see more very soon. This is an alien Gunboat but it's name and species will not be released. Ahh crap, I forgot to make that white space near the turrets black...opps...owell, you get the point...click on the picture to see a large/huge version of it. Bam. Two F-303 fighter bays, railguns, missile silos, transporters, beam weapons, an Asgard computer core, and (because this is what really matters) an awesome captain's chair. 1 WORD........DRONES . 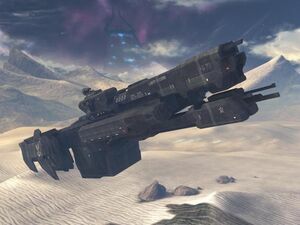 The Ancients know how to make badass ships. Aurora rules. Pssh. Everyone knows that the Asgard computer core on the Daedalus can just create a temporal stasis field around the ship. Let's see your drones try and get through that. More seriously, the Aurora would probably be my second choice. I generally like ships that were designed for what they're used for, and not for asthetics. Thats why I love the industrial and we-don't-care-how-ugly-our-warships-are attitude of the Alterans and us. they look similar to 'Aliens', the special forces ahip. I have no idea why but dual pronged ships seem to be incredibly common in space scifi. Even though such a design is horrible weak from a structural standpoint.